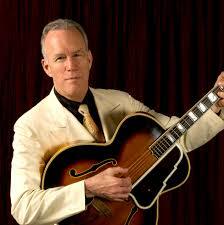 Best known for playing swing jazz, Tony Marcus has been a professional musician in a number of styles for 40 years. He's been a member of The Cheap Suit Serenaders, Cats & Jammers, Leftover Dreams, The Royal Society Jazz Orchestra, The Fountain of Youth Jug Band, Lost Weekend Western Swing Band, The Frank Wakefield Band, The Arkansas Sheiks and many more. He's toured the UK and Ireland with the Frisco Fire Band, and Japan with Geoff Muldaur and Fritz Richmond. He's performed in theatrical productions around the US and written articles for magazines such as Acoustic Guitar. He's a veteran teacher at such camps as PSGW, Augusta Heritage Workshops, CCMC, International Guitar Seminars, and others, but mostly he just loves playing music. He currently performs with Patrice Haan as Leftover Dreams.